Now is the high season of shrimp fry collection from nature in the coastal areas. Thousands of men, women and children are engaged day and night harvesting shrimp seedlings with their push, pull and trap nets in the rivers and channels that crisscross Khulna, Shatkhira and Bagerhat district encompassing the Sundarbans. In recognition that indiscriminate fry collection from nature is destructive, the Bangladesh Government banned collection of fries of shrimp and other fish from the coastal belt. But the law promulgated in September 2000 remains confined only in paper. Influence and pressure of the shrimp traders and interest groups have rendered the law ineffective. The officers concerned in the Forest Department have said that the government has set aside the law in consideration of severe consequences of abrupt ban on the poor fry collectors. Most of the shrimp fry collectors in the Shibsha, Pashur, Mongla, Chunkuri and other rivers of greater Khulna region never knew about the ban on shrimp fry collection. The legal measure was taken at the higher level and then relaxed. The fry collectors continued to procure written permission for a fee from the Forest Department for fry collection. The Sundabans, declared a world heritage in 1999 by UNESCO is considered to be particularly vulnerable due to prawn aquaculture and wild catch of shrimp fries that sustains the industry. The scene in Pashur, one of the major rivers that flows through the massive mangrove from the Mongla Port will make anyone curious. Human beings pushing through saline water, nets and boats everywhere ravage the river round the clock for months. Fry collectors in Pashur River said that average weekly income of a boat of two persons is Tk. 2,000 fries. Abdul Rashid (30), Md. Sohrab Hossain Howladar (45) and Kamal Fakir (30) of Bottala village of Jiudhara Union under the nearby Morelganj Upazila live in Jyomonir Thota during fry season. They live in a hut for Tk. 200 per month and catch shrimp fry from the Pashur river. All of them have stationary nets, boats and push nets. In their villages they are day laborers. But during the shrimp fry season they catch fries for six months. There are others who make a living out of prawn fry harvest and its trade. Middlemen and moneylenders take the fry from the collectors to the cultivators. They are often accused of cheating the fry collectors. Jyomonir Thota is a big trading center where the fry collectors and the middlemen bring the catch twice a day. The fries come from nearby and far-off rivers in the Sundarbans. It is alleged that the Forest Department also has its share of the income from the fry trade. To catch 1,400 fries in the Sundarbans Reserved forest a boat needs to procure a pass for Tk. 250.00 from the nearby forest office. One such forest office is Chandpai Range Forest Office. Fry collection activity is seen as farther as Katka, the southeast corner of the Sundarbans embracing the Bay of Bengal. Fry collection is said to be a significant economic activity for the local poor. The authorities argue that if a ban is imposed on shrimp fry collection, these poor people will be out of job. This seems to be quite an argument for those who have taken fry collection as an important economic occupation for many years. However, there are others aspects of fry harvest and its trade. Each of thousand of boats in the forest regularly collect wood and wood products from the Sundarbans and kill myriad quantities of fries of other shrimp and fish. More importantly, these fry collectors have been pushed out of their traditional occupation in agriculture because much of the land in the coastal areas are now shrimp farms which produce a commodity, not locally consumed. In view of long term ecological destruction shrimp fry collection from Nature is banned in many countries. Bangladesh, criticised for allowing opportunists in the shrimp industry immense leverage, took the legal measure but then digressed allegedly under pressure. The legal matter is not clear even to the government authorities in different departments. The Fisheries Officer Habibur Rahman Khondkar of Khulna district said, "We don't know how the Forest Department offices issues passes for collection in the reserved forest." 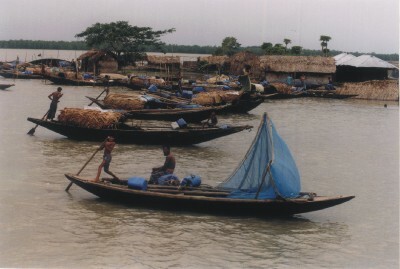 The law banning shrimp fry collection, "Protection and Conservation of Fish Rules,1985" says, "No person shall catch or cause to be caught fry or post larvae of fish, shrimp and prawns of any kind, in any form and in any way in the estuary and coastal waters of Bangladesh" (SRO No. 289/Act/2000). This law is simply ignored and the indiscriminate shrimp harvest from nature continue as usual. Beforehand, no fry collector had required a pass. Instead, each boat required a Boat Loaded Certificate-BLC. Now after the mockery with the law the fry collectors are paying to continue their job which may prove fatal for the Sundarban ecosystem. Shishir Moral and Lucille Sircar, researcher of Society for Environment and Human Development (SEHD).